The magic of a cappella music is best when experienced live. There’s nothing quite like sitting around listening to a group of people sing unaccompanied. A concert by Acappella is certainly no exception. After 20 years, Acappella finally released a “live” album. Recorded in August 2001 at the Krider Performing Arts Center in Paris, Tennessee, Acappella’s home town at that time, it was a night of pure magic – all caught on tape! 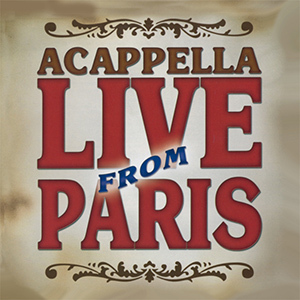 Loaded with amazing singing, improv humor and ministry – and including “Jesus Knows,” runner-up for Best Religious Song of 2002 by the Contemporary Acappella Society – Live From Paris is one album you absolutely must own.